Hi there! Many people made their first green numbers when majority of affiliates didn’t have to overthink cloacking as much as now. It became more difficult to earn same amount of money, as we used to do with pop and redirect traffic. It’s not only because of the new Chrome updates, and new ads placement rules of Google, but also because of bot traffic, spy tools, in particular, Adplexity. It’s one of the most modern spy tool in affiliate marketing. Arbitrageurs working with pop and redirect traffic are doing their best to tests and search of profit links, but competitors know how to surf your ads or Adplexity bots would post your landing pages or your domains on its service which can kill all your efforts in the shortest time. You shouldn’t be afraid of trying new solution which we made for you. If we speak about such function as integrated landing along with useful tool you can significantly add you a few dozens of percent to ROI. It won’t guarantee you 100% but it’s really possible that your links won’t be found. MagicChecker is services helping to protect your ad campaigns against bad traffic, competitors, spy tools, traffic source moderators, advertisers who are ready to monitor your ad campaigns. What is the aim of this service? Picture it, you will find a good offer + landing + source and launch it on your pop- traffic. Your ad campaign works with +200% ROI, but there is high possibility that after a while you would find your landings in spy services. If affiliate has enough resources and experience, he or she will have no trouble finding your ad campaign and coping your profit links. In such case your advertising campaign will get little ROI. Originally MagicChecker service was developed for the internal team and it was used privately during several years. Service was launched in December 2016. Currently it is on high demand through affiliates in the all verticals. This is one example of the product presented on the market. On that can be any cloacker that you want, for example, FraudFilter or self-made solutions set against defined traffic sources, bots, moderations. In this article you will get to know how to configure and use MagicChecker through the example of Binom tracker. 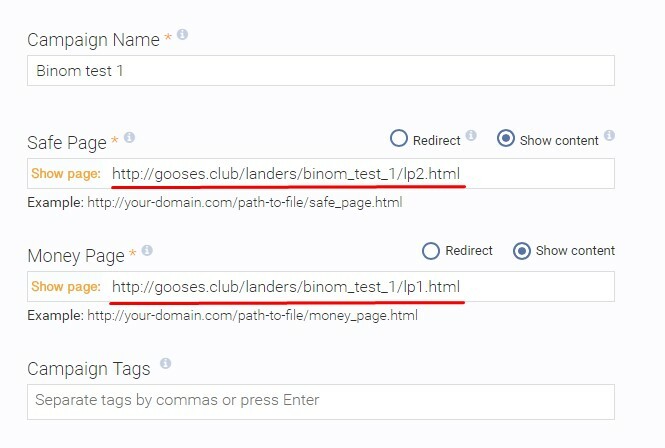 Working with Binom you can use MagicChecer without redirects to services. Tests showed that variant without redirect effective in terms of traffic lost and conversion. 1. Register on the websites magicchecker.com and binom.org. 2. To start working you need to create empty campaign, you add rules and exceptions (geo, ip list etc.) can at once. In the fields highlighted in red you can insert whatever you want, the main is to save your campaign; we will return to that. For configuration process understanding it’s important to make sense out of Safe Page and Money Page. 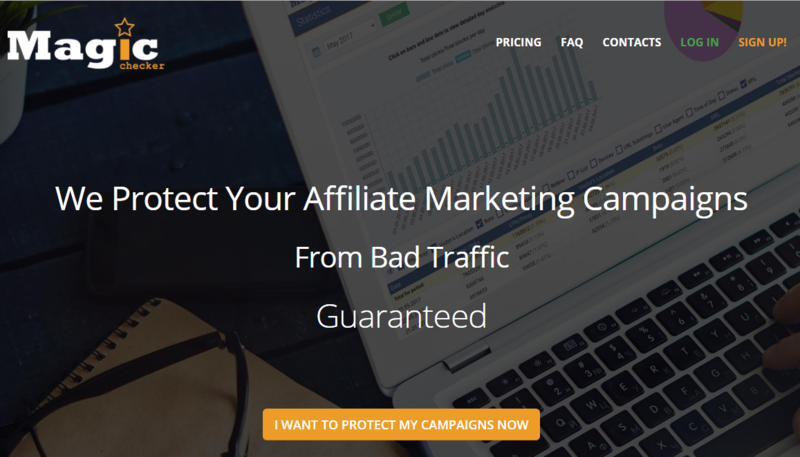 Safe page is the page you want to show to spy tools, traffic source moderators and account managers of an affiliated network satisfying their rules and demands. Money page is your real target page you want to show to your potential users. So,now we figured out money page and safe page. Let’s move on! Let’s review each rule block and what they are responsible for. 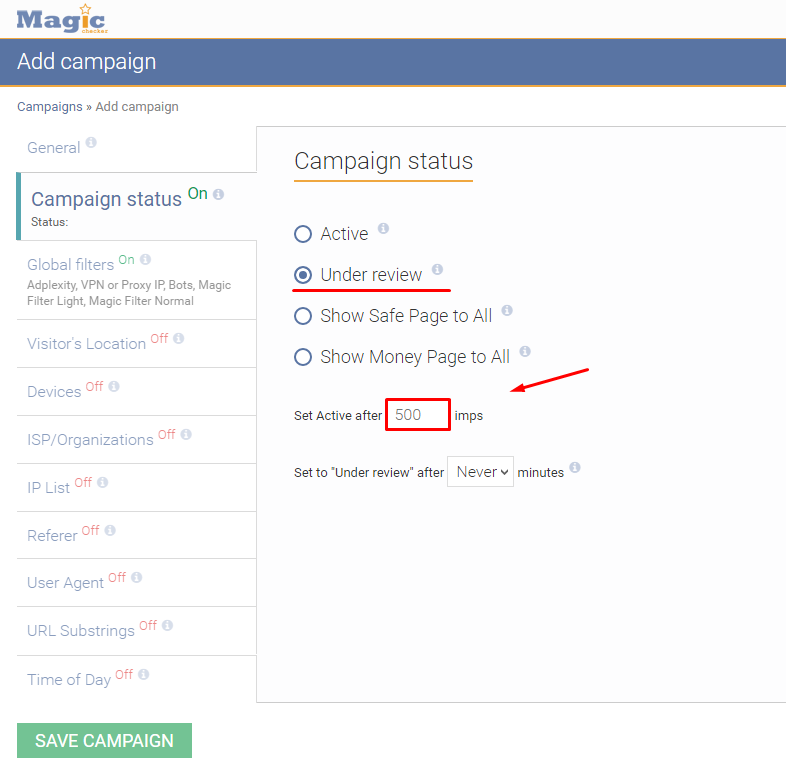 This status informs that you campaign is active, and MagicChecker is protecting you based on your rules. Advice. 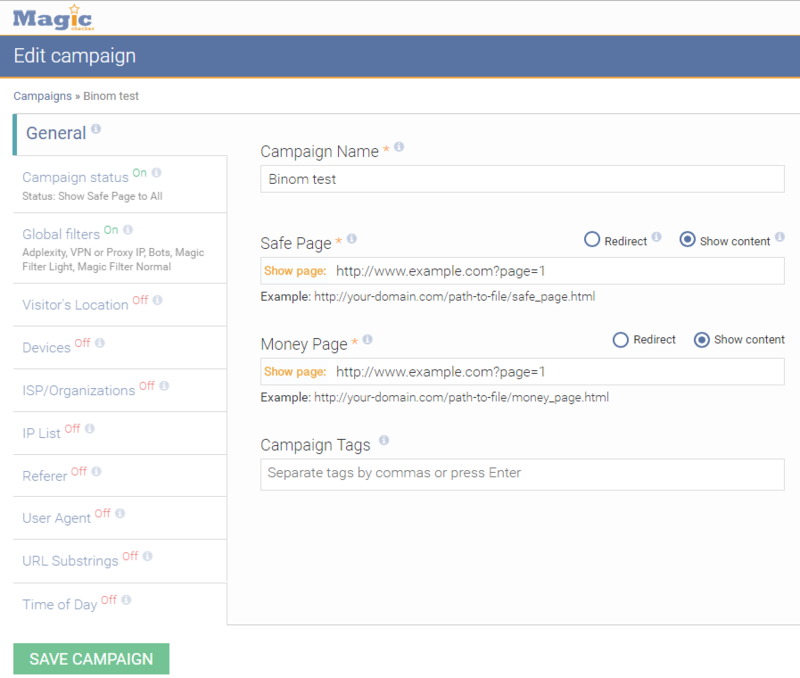 Switch your campaigns from “Active” to the “Show Safe Page to All” status if you temporary paused your traffic. This status means that you show your “safe page” to everyone. Advice. You can switch your campaign to the mode “Under review” before sanding ad campaign’s URL for the traffic source. After you can see moderator’s clicks and add them as a rule for MagicChecker. Advice. For status “Under review” you can set up set limits of ad campaign impressions as 500 impressions, as in the example below (check screenshot). Your campaign will be automaticity switched to Active status. It can be useful, if you know that traffic source moderators usually perform 15 visits before your campaign approving. When this status is turned on, service doesn’t protect you and show you page “Money page” to all visitors. Advice. Use method “Show Money Page to All” if you want to check accuracy of your Money page set up. But don’t forget to change it. This status means that you send all your traffic only to the page «Money Page». Advice: Switch your campaigns from “Active” to “Show Safe Page to All” if you paused you traffic temporary. Let’s review filters. In this blog (check the screenshot below) filters’ set ups are made with consideration of our experience and practice, these configurations are the most efficient for work. Always turn Extra protection on, this is the secret technology of the product developers helping to increase the chance of cloacking. This filter blocks data centers of web hosting companies and cloud solutions providers from spying on your ad campaigns. Advice. Try using HMA or other VPN services for this filter checkup. This configuration protects you against bots. Good to know. All modern services use bots for automatic search of your campaigns. This filter will eliminate primitive bots. 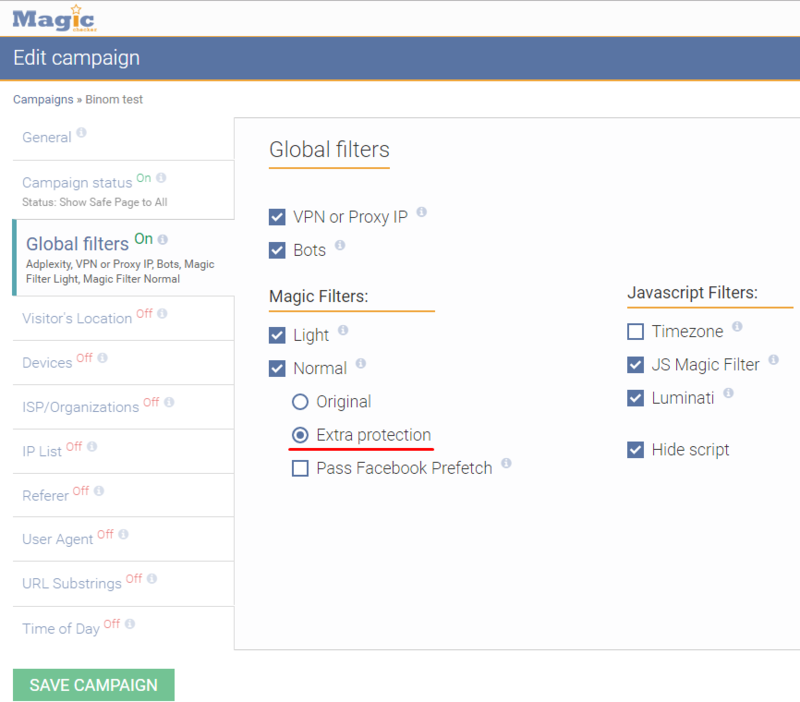 Magic Filters is the secret technology of the product developers, we recommend turning it on in all campaigns. Time Zone filter compares time zone of visitor’s device with GEO time zone. Good to know. Sometimes difference makes several hours (especially in TIER3 GEOs), we recommend using window with duration 60-120 minutes. JS Magic Filter is additional protection Magic Filters. If you experience problems with PHP filters, turn it on. Turn this filter off, if you experience problems with Adplexity. Luminati filter protects you against the best proxy network in the world. Good to know. 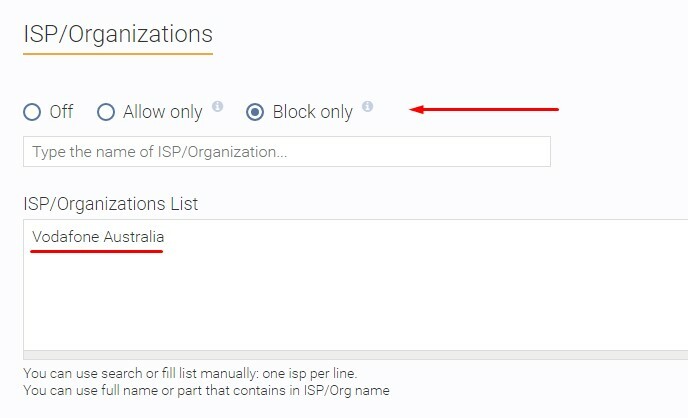 Luminati has huge amount of IP address in its base but this filter is able to detect it. This is one of the examples how this block works. Advice. You can use this rule when you buy traffic all over the world, and want to turn some countries off. You can choose which you want to get on your landings. How can we use this configuration? Check in your tracker which internet providers are beneficial for you. And allow only them for your traffic. Thus, you will get bigger protection. The same way you can block some Internet providers. For example, if you know that traffic source moderatos use specific internet provider to trace your creatives or if you infringe work rule with them. 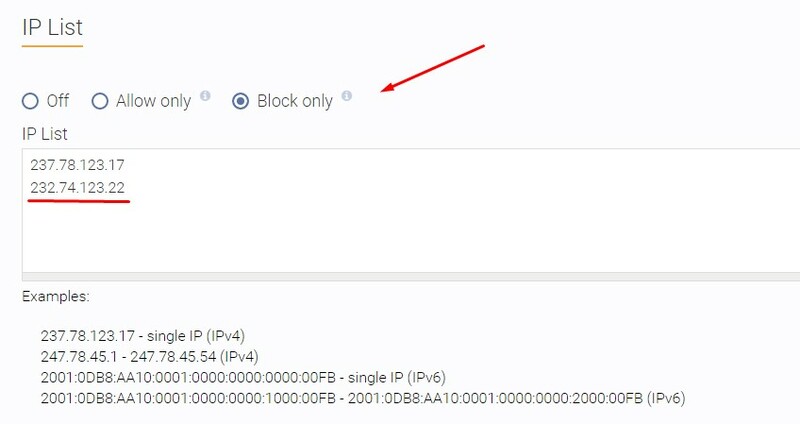 You can block only users of selected ranges IP. Advice. If you know IP-addresses or IP ranges of moderators, competitors, advertisers you can add them to rule. They will be able to see “Safe page”. 1. It’s necessary to download index.php file and send it to the archive for integrated landing creation. 2. Then you need to create folder and make archive out of it in zip file. It should come out as it shown in the example. Next step is to go to a server where you store your landing. You will need FileZilla. 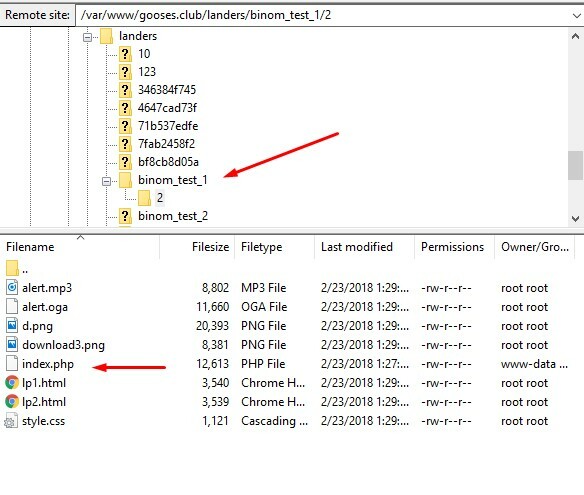 You have to find folder with downloaded integrated landing on server. Then you need to download your landings Money page and Safe page. The main is to place index.php to the same place with your landings. Let’s be back to MagicChecker. We need to defined paths to our landings. Don’t forget to add .html at the end of the link. After we define all links with our landings, we need to create campaign in the tracker with our integrated landings. You should set up status “under review” or do it manually after moderation. If moderator or network manager come into your advertising campaign he would see Safe page. We set limits of ad campaign impressions as 500 impressions, further Money page will be shown. You can check in this video an example of configuration. I used already finished campaigns but the main point of a configuration is clear.